Mr. Hagel and several co-authors provide a compelling argument for future disruption on a large scale. The report focuses primarily on the visuals first two boxes, although examples of disruptive scenarios are provided. 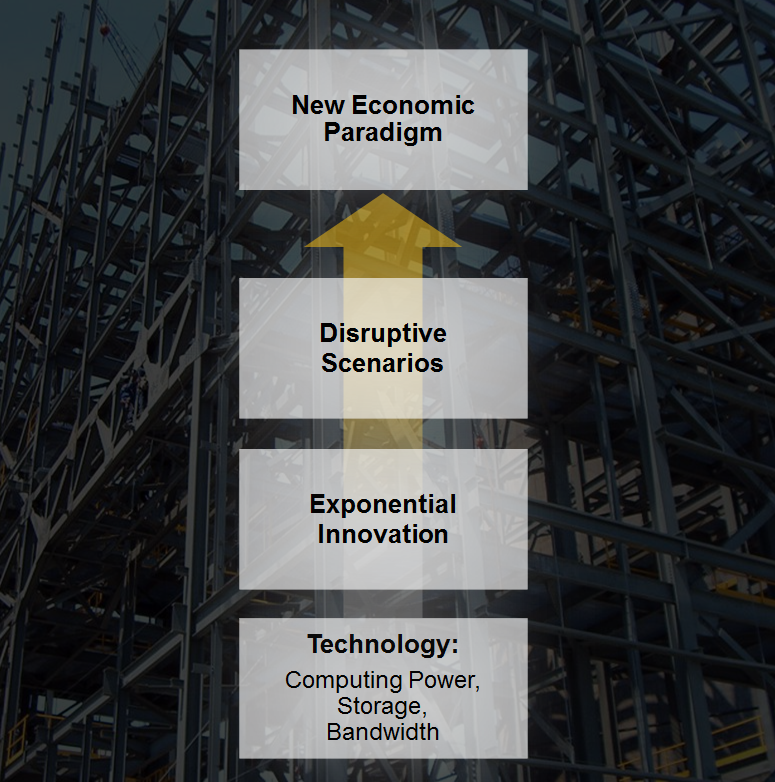 The fourth box represents the ultimate disruption – the potential for A New Economic Paradigm brought on by the cumulative effect of disruptive scenarios. With technology as the foundation, value multiplies as building blocks combine. So the key term – also a focus of the aforementioned report – is combination. In this context, a building block can be technology, innovation, or disruptive scenario. There are already signs of building blocks combining to produce an amplified effect. For example, the combinatorial power of 3D printing, the Internet of Things (IoT), Big Data, and artificial intelligence will enable software-driven business models in which every aspect of a physical product — from creation to delivery — is digitally controlled. This blurring of the boundaries between digital and physical worlds will enable rapid prototyping with customers, further exacerbating the challenges associated with accelerating innovation cycles. Disruptive scenarios will also combine. One example in my Connected Health post describes the combination of the connected health and smart home disruptive scenarios. The outcome of this combinatorial innovation is a smart home that becomes a future source of behavioral data and a foundational piece of remote monitoring. For example, smart carpets will detect falls associated with homebound seniors and proactively reduce medical response times. A smart fridge could drive health insurance discounts for storing healthy food. There are countless opportunities for virtual healthcare enabled by the Smart Home. I’ve used the visual below to capture this thinking. There are three curves – one spawns the other. The technology curve (computing power, storage, and bandwidth) is implied. The innovation curve focuses on broad categories of innovation (versus specific innovations like Uber). As these innovations combine, they spawn a disruptive scenario curve (autonomous vehicles, smart homes, etc.). The potential exists for these disruptive scenarios to combine to drive a third curve – a new economic paradigm. The same combinatorial dynamic that drives disruption provides a mechanism to exploit opportunity. But to get there, leaders need to move from an isolated and compartmental view of technology and innovation, to this combinatorial view. I really like this quote from the report: “We cannot grasp the full potential of exponential technologies until we explore the interactions across them.” Indeed, combinatorial innovation accelerates the exponential pace of change to enable unprecedented disruption – and I don’t believe we’ve grasped its full potential.